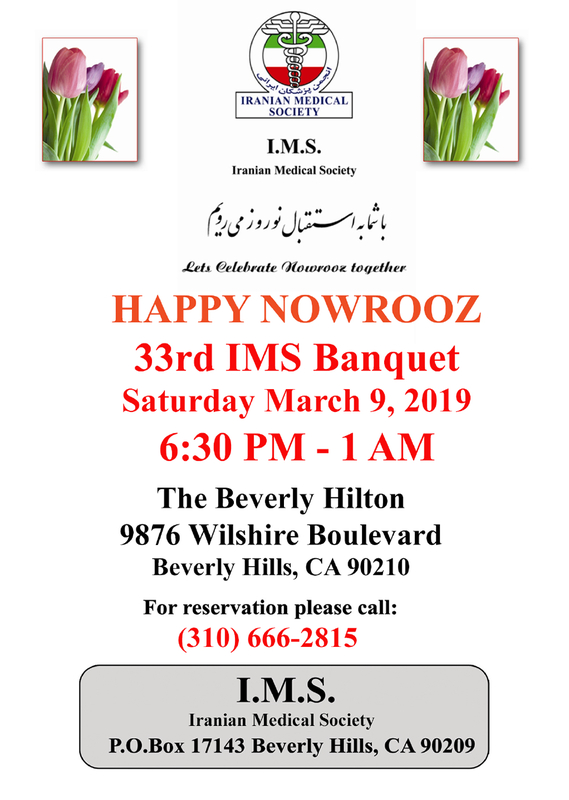 I.M.S. stands for the Iranian Medical Society. Founded in 1986 by a group of medical doctors for professional medical advancement and to enhance the Iranian Culture. • To gather Iranian American Physicians and facilitate each other with knowledge through each own individual specialties for the purpose of better treatment and patient's care. • To enhance the Iranian culture. An ancient culture based on loving and kindness and learning encouragement from birth to death. • To break a linguistic barrier for the elderly Iranian patients and introduce a Farsi speaking physician to help and support their needs. a. To update their knowledge and skills for better patient's care. b. To fulfill the CME requirement for the validation of medical license. • To find different specialties among our fellow members for a better, fast and convenient service to the patients. • To get CME accreditation for our society for the purpose of organizing a monthly meeting to update physician's skill and knowledge and treat patients with the latest medical surgical development.